Five o’clock News, Journal, Post, Chicago, Mail, Dispatch. A selling of my papers, and that’s not easy play. I’m waiting for my Heralds, and a dancing on the walk. A murder and a suicide, and Barnum’s great big show. Elopement o’er in Jersey, with a preacher getting tight. I help him sell his papers because his mother’s blind. Can’t he sing a ballad! it aint no use to talk! A darling ‘mong the newsboys, when he’s singing on the walk. The Fenians captured Canada andd Gladstone’s got the gout. Embezzlement in Wall street, and a barber lost his lip. With buckwheat cakes and lasses enough to feed a man. They stop to see the newsboys when they dance upon the walk. A Democratic vict’ry down in Penn-syl-va-ne-i. They’re goin’ to fight with all their might to lick the poor Chinee. And pouting to the newsboys when we’re on the Herald walk. And collar’d all the boodle and he’s skipt to Canada. of de World Building does for me berth. Dey all knows me wherever I go. Dat’s de Pride of Newspaper Row. De Pride of Newspaper Row. Never tells me to keep of de ground. He’s de Pride of Newspaper Row. 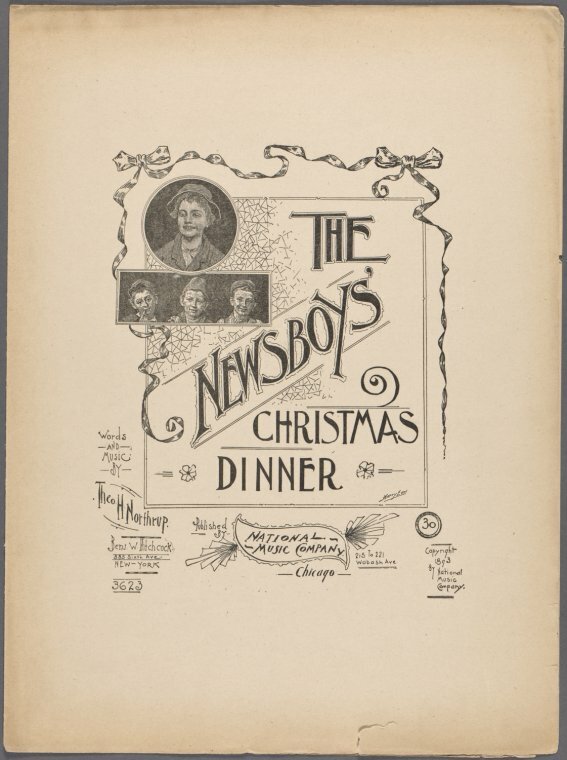 From the Broadway Belle.—Affectionately dedicated to the numerous respectable and useful body of New York Newsboys. And then I hurry all about to spread the morning news. And all the morning news. And the ladies they will have it, for it drives away the blues. With all the fancy news. Of all the lives you read of, the newsboy’s life for me! The newsboy’s life for me! Andrews, Printer, 38 Chtham St, N. Y., Dealer in Songs, Game Books, Motto Verses, c. Wholesale and Retail. Written in 1850, many different versions of “Wait for the Wagon” were published the next year, as it became a minstrel show favorite and even used as a campaign song for Millard Fillmore (with revised, political lyrics, of course). During the Civil War, a version with lyrics about succession was popular in the South, although the video below contains the standardized lyrics. 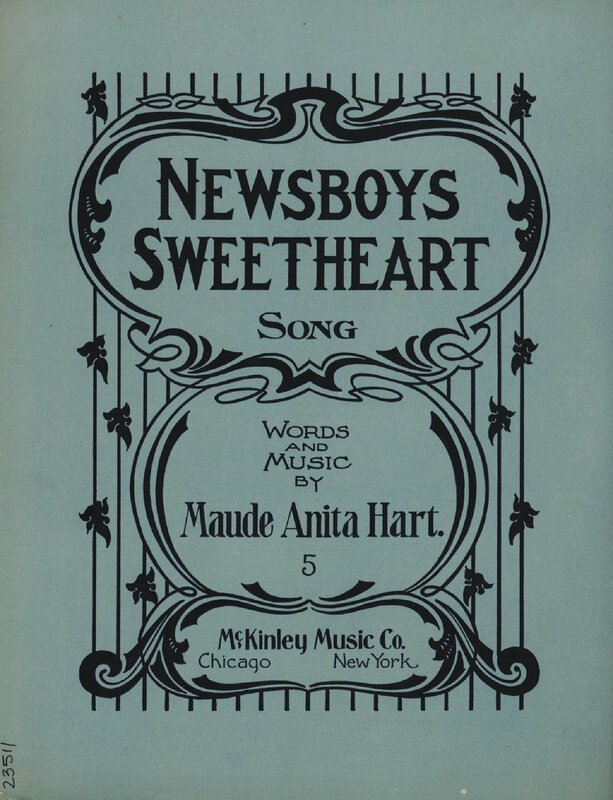 The Library of Congress has one set of “Wait for the Wagon” sheet music online here and the lyrics sheet for “The News Boy” here. Written in 1894 by James W Blake & Charles B. Lawlor, “The Sidewalks of New York” is such an iconic song. It’s also known as “East Side, West Side” because of the first line of the chorus. As a bonus, I found a video of a player piano with the lyrics included on the roll! Original lyrics by James W. Blake.